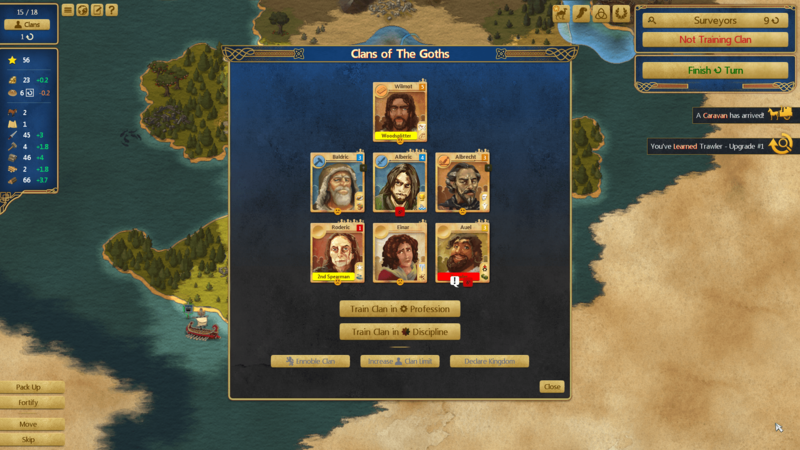 Jon Shafer’s At the Gates is an ambitious 4X grand strategy game, from Jon Schafer, the lead designer of Civilization V. Comparisons to the two games will obviously be made, but the actual similarities are few and far between. The game combines the strategy and roguelike genres into a hit and miss bundle that is fun, but not for everyone. At the Gates is a strategy game with a twist. You are tasked with building up a rival to Rome. Starting in 400’s, you control a nomadic camp that will grow through the addition of clans into a Rome toppling city-state. All this while competing with other historic peoples attempting to do the same. There are ten civilizations to play as. However, at the start of the game, you may only choose to play as one, The Goths. The other nine are locked until you form a pact or conquer them in game. It is an interesting premise that is sure to not sit well with everyone. The clans you control are the biggest difference between Civ V and At the Gates. You build your fame and fortune not through expanding cities, but rather through ruling over clans. The clans all come with their own strengths and weaknesses. 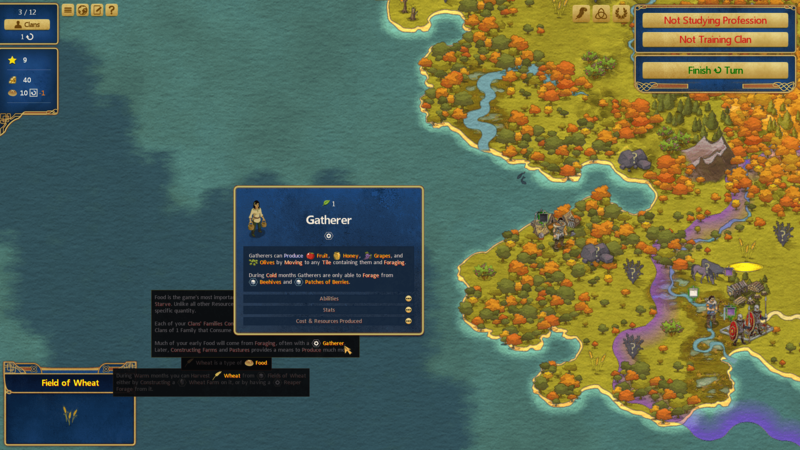 You will assign professions to your clans and set them out to gather resources around the area. The resources are used to grow and sustain your settlement. The resources of an area deplete as you use them. These resources play a critical role in keeping your clans alive through the often-harsh winters. Run out of food and your clans will begin to die off. Clans are trained in different jobs. The jobs tree replaces the standard strategy staple tech tree. Jobs branch out to other jobs and even different levels of jobs. You assign clans jobs and they gain experience at doing said job. Jobs can be swapped, but clans all come with certain traits or desires that affect their ability to do the job. A clan that fears water may not make the best fishermen, or explorers. Most of the game is matching the proper clan to the job. The weather, A.I. leaders and bandits are your biggest nemesis. This is where flaws in the game begin to arise. The A.I. leaders seldom, if ever attack you directly. 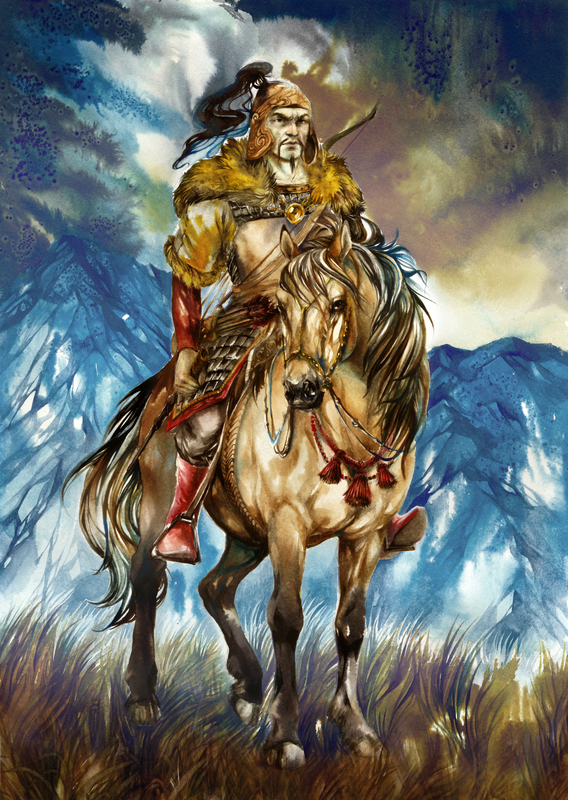 Bandits will kill or kidnap your clansmen while they are doing their jobs. This is not the issue. The issue is that when this happens you receive no notification. The unit either disappears or changes to the bandit’s color. I had a game where one of my gathers disappeared while gathering olives. No notification, just gone. It wasn’t until investigation on my part that I noticed she was probably too close to a bandit base. Overall, the gameplay is standard 4X strategy fare. There are a few areas where the game truly shines. One of which is the tooltip system. Strategy games have a high entry barrier. They are often complex, having so many things that affect other in-game things. They can be confusing and overwhelming. In most games, if you want to know how something works, you must leave gameplay and go to an in-game FAQ. At the Gates, each keyword on the screen can be hovered over to get an explanation of what it does. Keywords inside of said explanation can hover over, and so forth. It is a fantastic system that keeps the player in the game. The other area in which the game stands out is the visuals. The watercolor art style is strikingly beautiful and really adds to the gameplay. The clarity of items on the map is also a plus. Problems arise in the implementation of the camera system. The map is huge and randomized. The problems occur when clans stray too far from home. They become difficult to find and the movement of the camera can be a bit clunky. The idle clan button helps in finding your clans, but only if they need orders. The audio in At the Gates is a bit of a letdown. The game features the standard beeps and bells of most games. The soundtrack is incredibly lacking when compared to almost any other strategy game. As far as I can tell there is only one song and it is forgettable at best. Jon Shafer’s At the Gates is a slow burn. It is most definitely not for everyone. It is absolutely for strategy and simulation fans. Roguelike fans will most likely enjoy it as well. Though the game is not heavy on action. If you enjoy games that take a long time to play out and require thought and planning, then Jon Schafer’s At the Gates is a game you should give a try. While it is far from a perfect game. It should not be overlooked if for no other reason then its attempt to breathe new life into the grand strategy genre. Its excellent tooltip system can only help newcomers to the genre. There is a base here for something special. Perhaps with a few patches, the game can evolve into something truly amazing. As it stands, it is merely another entry into a large field. Albeit one with a great vision.